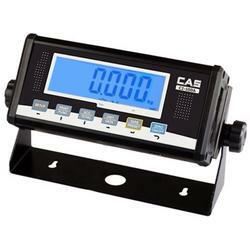 The CAS R2 Series Drum Scale is a portable, low profile platform scale with integral ramps, live side rails, wheels, and handles to insure versatility and portability. Use with any general industrial indicator capable of powering up to four (4) 350 ohm load cells or order with CAS Quick Connect hardware to simply interface CAS CI-2001 Series, CI-200 Series, or CI-100A Indicators. Use with any general industrial indicator capable of powering up to four (4) 350 ohm load cells or order with CAS optional Quick Connect hardware to simply interface to CAS CI-2001 Series, CI-200 Series, or CI-100A Indicators. The light weight R2 Series Drum Scale has two heavy duty handles and two casters built into the frame. Need to move your scale? No problem. Pick it up and roll it. Its that easy! The CI-2001 Seres Indicator with RS-232. 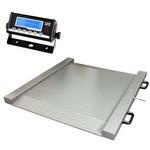 Use in a variety of applications - floor scales, livestock scales, platform scales, pallet scales, and much more. With its bright red display, the CI-2001 Series Indicator is easy to read. Legal for trade. With a display resolution up to 1/100,000, visibility is insured by a blue backlit 1" high LCD display. Standard features include a full duplex RS232 serial interface, USB interface, multiple communication protocols, time & date, and various selectable units of measurement including lb, kg, g, oz, lb:oz, pieces (non-commercial only), and percent.